A. Paravicini Bagliani, Introduction. GENERAL PERSPECTIVES. - C. Crisciani, Death as a Destiny and the Hope of Long Life. The Latin Middle Ages – D. Rossi, Faith or Fate? The Path towards Immortality according to the Tantric Traditions of Tibet. PREDICTING LIFE AND DEATH. D. Jacquart, Est-il possible et légitime pour un médecin médiéval de prévoir la longévité d’un patient? – J. Ziegler, Why did the Patriarchs Live so long? 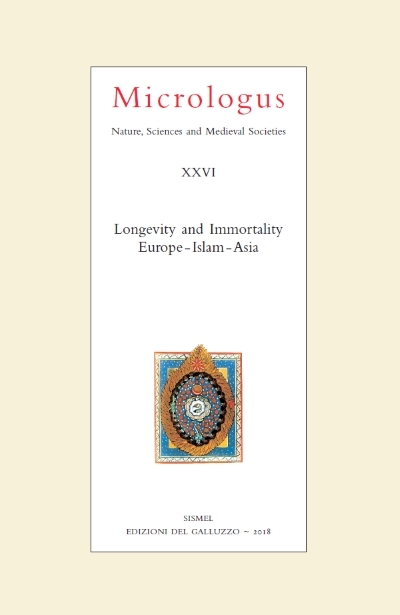 On the Role of the Bible in the Discourse on Longevity around 1300 – R. Scheuermann, «One will Quickly die!». Predictions of Death in Three Tibetan Buddhis Divination Manuals. PROLONGING LIFE. A. Paravicini Bagliani, The Prolongation of Life and its Limits. Western Europe, XIIIth-XVIth c. – Ch. Burnett, Natural Death and the Alleviation of Old Age in the Middle Ages – J. Coste, La «Mort de Vieillesse» dans les statistiques de mortalité (XVIIe siècle - XXIe siècle): une catégorie problématique – D. Kahn, Quintessence and the Prolongation of Life in the Works of Paracelsus – M. Heiduk, A Quest for Longevity? A New Approach to the Earliest Testimonies of Medieval Alchemy – M. Pastoureau, Longévité animale dans les traditions médiévales. ATTAINING IMMORTALITY. F. Santi, Teologie della resurrezione della carne (Sec. XIII-XIV) – A. Caiozzo, Rêves d’immortalité, trois rois, deux héros, un prophète – M. Förg, The Centaur’s Death: The Myth of Chiron and the Transfer of Immortality – B. A. S. Dajani, Immortality Through Love in Classical Arab Literature – B. Hendrischke, Modes of Avoiding Death in the Scripture on Great Peace (Taiping jing ...) – D. Steavu, The Marvelous Fungus and The Secret of Divine Immortals – F. Pregadio, Which is the Daoist Immortal Body? Indexes.